Kingdom of Albania, Zog I. Beautiful Gold 20 Franga Ari Coin. 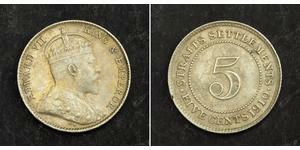 Mint year: 1927 Reference: KM-12. Mintage: 5,053 pcs. Mint Place: Vienna (V) Denomination: 20 Franga Ari Condition: Certified and graded by PCGS as MS-64! Material: Gold (.900) - 0.1867 oz. 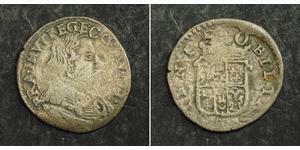 AGW Diameter: 20mm Weight: 6.45gm Obverse: Bearded bust of George Kastrioti “Skanderbeg” (“Lord Alexander”) right. Designer´s signature below. 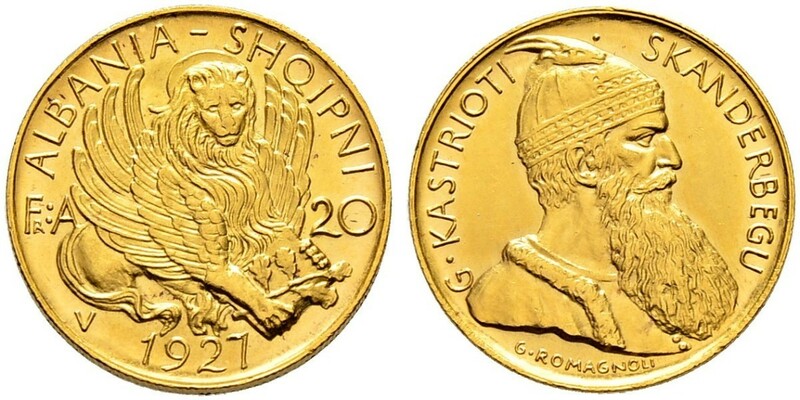 Legend: KASTRIOTI SKANDERBEGU / G. ROMAGNOLI Reverse: Venetian nimbate and winged lion right. Value (Fr.A-20) split in fields, mint initial (V) and date (1927) below. Legend: ALBANIA – SHQIPNI George Kastrioti Skanderbeg (6 May 1405 – 17 January 1468), widely known as Skanderbeg (from Turkish: Iskender Bey, meaning “Lord Alexander”, or “Leader Alexander”; Albanian: Gjergj Kastrioti Skënderbeu), was a 15th-century Albanian lord. He was appointed as the governor of the Sanjak of Dibra by the Ottoman Turks in 1440. In 1444, he initiated and organized the League of Lezhë, which proclaimed him Chief of the League of the Albanian people, and defended the region of Albania against the Ottoman Empire for more than two decades. Skanderbeg’s military skills presented a major obstacle to Ottoman expansion, and he was considered by many in western Europe to be a model of Christian resistance against the Ottoman Muslims. Skanderbeg is Albania’s most important national hero and a key figure of the Albanian National Awakening. Skanderbeg was born in 1405 to the noble Kastrioti family, in Sinë, a village in Dibra. Sultan Murad II took him hostage in 1423 and he fought for the Ottoman Empire during next twenty years. In 1443, he deserted the Ottomans during the Battle of Niš and became the ruler of Krujë. In 1444, he organized local leaders into the League of Lezhë, a federation aimed at uniting their forces for war against the Ottomans. Skanderbeg’s first victory against the Ottomans, at the Battle of Torvioll in the same year marked the beginning of more than 20 years of war with the Ottomans. Skanderbeg’s forces achieved more than 20 victories in the field and withstood three sieges of his capital, Krujë. In 1451 he recognized de jure the suzerainty of Kingdom of Naples through the Treaty of Gaeta, to ensure a protective alliance, although he remained an independent ruler de facto. ] In 1460–1461, he participated in Italy’s civil wars in support of Ferdinand I of Naples. In 1463, he became the chief commander of the crusading forces of Pope Pius II, but the Pope died while the armies were still gathering. Left alone to fight the Ottomans, Skanderbeg did so until he died in January 1468. Marin Barleti, an early 16th century Albanian historian, wrote a biography of Skanderbeg, which was printed between 1508 and 1510. The work, written in Latin and in a Renaissance and panegyric style, was translated into all the major languages of Western Europe from the 16th through the 18th centuries. Such translations inspired an opera by Vivaldi, and literary creations by eminent writers such as playwrights William Havard and George Lillo, French poet Ronsard, English poet Byron, and American poet Henry Wadsworth Longfellow. 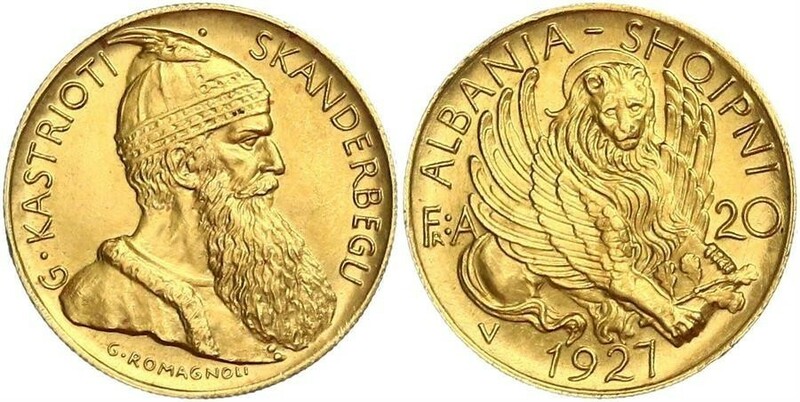 Zog I, Skanderbeg III of the Albanians ( 8 October 1895 – 9 April 1961), born Ahmet Muhtar Bej Zogolli, was the ruler of Albania from 1925 to 1939, first as President (1925-1928) and as King (1928-1939). He previously served as Prime Minister of Albania. Zog was born Ahmet Muhtar Bej Zogolli in Burgajet Castle, near Burrel in the Ottoman Empire, second son to Xhemal Pasha Zogolli, and first son by his second wife Sadijé Toptani in 1895. His family was a beylik family of landowners, with feudal authority over the region of Mati. His mother’s Toptani family claimed to be descended from the sister of Albania’s greatest national hero, the 15th-century general Skanderbeg. He was educated at Galatasaray High School (Lycée Impérial de Galatasaray) in Constantinople, then the seat of the decaying Ottoman Empire, which controlled Albania. Upon his father’s death in about 1908, Zogolli became governor of Mat, being appointed ahead of his elder brother, Xhelal Bey Zogolli. In 1912, he signed the Albanian Declaration of Independence as the representative of the Mat District. As a young man during the First World War, Zogolli volunteered on the side of Austria-Hungary. He was detained at Vienna in 1917 and 1918 and in Rome in 1918 and 1919 before returning to Albania in 1919. During his time in Vienna, he grew to enjoy a Western European lifestyle. Upon his return, Zogolli became involved in the political life of the fledgling Albanian government that had been created in the wake of the First World War. His political supporters included many southern feudal landowners (called beys, Turkish for “province chieftain”, the social group to which he belonged) and noble families in the north, along with merchants, industrialists, and intellectuals. During the early 1920s, Zogolli served as Governor of Shkodër (1920–1921), Minister of the Interior (March–November 1920, 1921–1924), and chief of the Albanian military (1921–1922). His primary rivals were Luigj Gurakuqi and Fan S. Noli. In 1922, Zogolli formally changed his surname from the turkified Zogolli to Zogu, which in the Albanian language means “bird”. In 1923, he was shot and wounded in Parliament. A crisis arose in 1924 after the assassination of one of Zogu’s industrialist opponents, Avni Rustemi; in the aftermath, a leftist revolt forced Zogu, along with 600 of his allies, into exile in June 1924. He returned to Albania with the backing of Yugoslav forces and Yugoslavia-based White Russian troops under General Wrangel and became Prime Minister. Zogu was officially elected as the first President of Albania by the Constituent Assembly on 21 January 1925, taking office on 1 February for a seven-year term. Zogu’s government followed the European model, though large parts of Albania still maintained a social structure unchanged from the days of Ottoman rule, and most villages were serf plantations run by the Beys. On 28 June 1925, Zogu ceded Sveti Naum to Yugoslavia as a gesture of recognition to the Yugoslav aid to him. Zogu enacted several major reforms. Zogu’s principal ally during this period was Italy, which lent his government funds in exchange for a greater role in Albania’s fiscal policy. During Zogu’s presidency, serfdom was gradually eliminated. For the first time since the death of Skanderbeg, Albania began to emerge as a nation, rather than a feudal patchwork of local Beyliks. His administration was marred by disputes with Kosovar leaders, primarily Hasan Prishtina and Bajram Curri. On the debit side, however, Zogu’s Albania was a police state. He all but eliminated civil liberties, censored the press, and murdered political opponents. Under the constitution, Zogu was vested with sweeping executive and legislative powers, including the right to appoint one-third of the upper house. 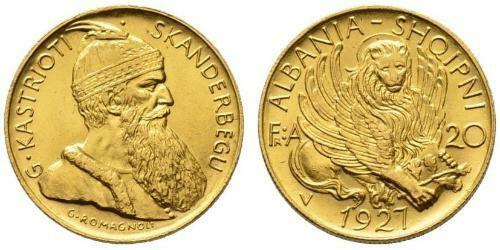 On 1 September 1928 General Zogu was crowned King of the Albanians (Mbret i Shqiptarëve in Albanian), and declared Field Marshal of the Royal Albanian Army on the same day. He proclaimed a constitutional monarchy similar to the contemporary regime in Italy, created a strong police force, and instituted the Zogist salute (flat hand over the heart with palm facing downwards). He claimed to be a successor of Skanderbeg, through descent through Skanderbeg’s sister. 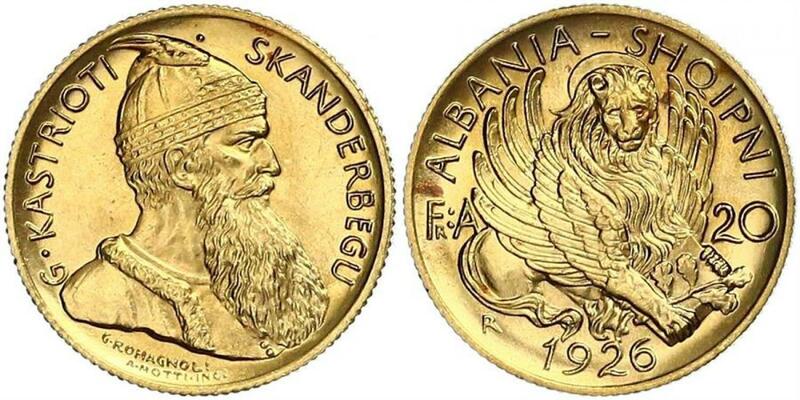 Zog hoarded gold coins and precious stones, which were used to back Albania’s first paper currency. Zog’s mother, Sadije, was declared Queen Mother of Albania, and Zog also gave his brother and sisters Royal status as Prince and Princesses Zogu. One of his sisters, Senije, Princess Zogu (c1897–1969), married His Imperial Highness Prince Shehzade Mehmed Abid Efendi of Turkey, a son of Sultan Abdul Hamid II. Zog’s constitution forbade any Prince of the Royal House from serving as Prime Minister or a member of the Cabinet and contained provisions for the potential extinction of the Royal Family. Ironically, in light of later events, the constitution also forbade the union of the Albanian throne with that of any other country. Under the Zogist constitution, the King of the Albanians, like the King of the Belgians, exercised Royal powers only after taking an oath before Parliament; Zog himself swore an oath on the Bible and the Qur’an (the king being Muslim) in an attempt to unify the country. In 1929, King Zog abolished Islamic law in Albania, adopting in its place a civil code based on the Swiss one, as Ataturk’s Turkey had done in the same decade. Although nominally a constitutional monarch, in practice Zog retained the dictatorial powers he’d enjoyed as president. In 1938, Zog opened the borders of Albania to Jewish refugees fleeing persecution in Nazi Germany. ALBANIEN Zogu I. Präsident 1925-1928, König 1928-1939 20 Franga Ari 1927, Wien. Skanderbeg. 6.45 g. Schl. 19. Fr. 6. Fast FDC. ALBANIEN Zogu I. Präsident 1925-1928, König 1928-1939 20 Franga Ari 1926, Rom. Skanderbeg. 6.46 g. Schl. 16. Fr. 6. Gutes vorzüglich. ALBANIEN Zogu I. Präsident 1925-1928, König 1928-1939 20 Franga Ari 1926, Rom. Skanderbeg. 6.45 g. Schl. 16. Fr. 6. Gutes vorzüglich.